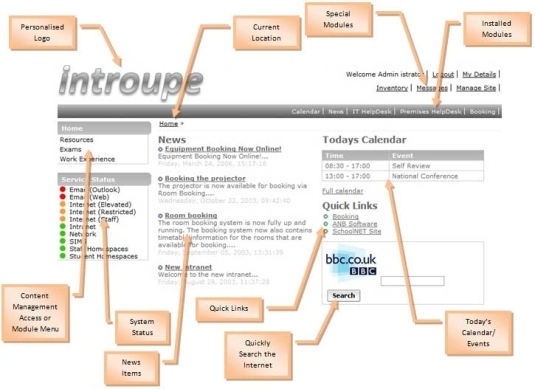 introupe is an Intranet system originally developed by a school for schools. But since it was commercialised in 2005 it has been adopted by businesses too, due to the flexibility and usefulness it provides. Most organisations use an Intranet for distributing information. Otherwise it would be a huge task to distribute information when you have hundreds and thousands of employees/staff/users. An Intranet can help cure the headache of distributing information to so many people. But it can also greatly assist with small companies too! An Intranet is the perfect place to post announcements, news, minutes of meetings, reports, memos, agendas and goals. Thereby keeping all employees/staff/users up-to-date with your organisation. It also allows people to post critical information for all employees/staff/users to see. Thereby saving time with various different people trying to find out the information they seek. The main aims of introupe are to improve an organisations internal communications and efficiency by providing various tools for distributing information and improving collaboration, whilst also providing other useful services. 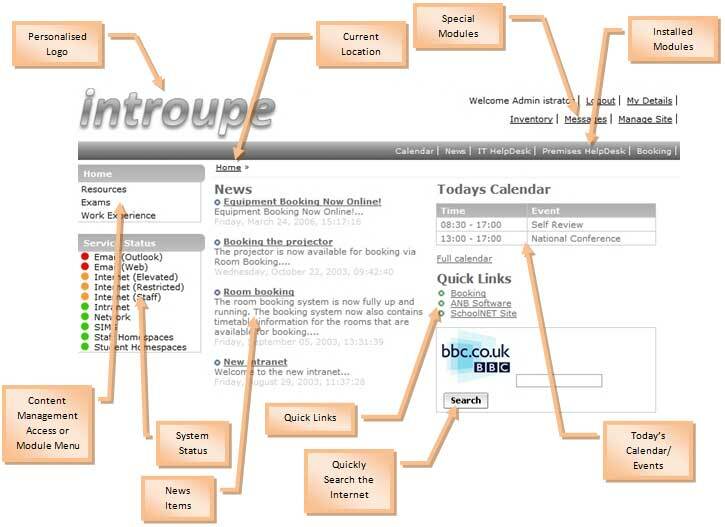 introupe is an out-of-the-box Intranet system designed to be easy-to-use, easy to install and maintain, and user-friendly. It has all the essential features a school or business requires in order to improve communication and collaboration. With new modules being developed all the time, and access for anyone to add their own modules, introupe is the perfect choice as your Intranet solution. The future of this system is very bright. Since its introduction in 2000 numerous modules have been created to improve the administration in schools and organisations. There is potentially an unlimited possibility for what this system can do. As more and more modules are developed the more versatile the system will become. For a list of improvements and ideas please see the Improvements page.